At approx 11:40 we will have the Easter Egg Hunt - outside on the field if it is not Raining or UNDER the TENT if it is raining. Happy Easter to all our players, coaches and families. Anyone interested in coaching in 2019 below are certification courses you will need for this year. You will also need this courses to be a coach at the CYC in Philadelphia, July 25-28. Pre-registration for these coaching courses is required. 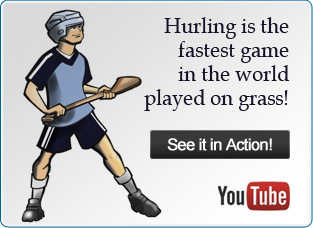 Participants should first visit https://learning.gaa.ie/login to create an account on the GAA Learning portal. After creating an account and validating their email address, participants may then visit the web links as above for their desired course and utilize the enrollment keys provided to register for the course. Attendees of the Award One Coaching Course should be sure to enroll on both course links in order to receive credit for both Adult and Youth portions of the course. Please feel free to contact Aisling Kerr at gda.northeast.usa@gaa.ie or (617) 571 - 1708 with any questions. Looking forward to a couple of great courses in Hartford! The Minor Board plans to utilize U16 and U18 players from within our division as referees for the U6, U8, U10, and U12 games in our upcoming Spring League. Referees will be required to attend a referee's clinic (at a time and date to be confirmed) in order to be certified, and will be compensated $25 per game. Please share this email with any players from your club that may be interested. 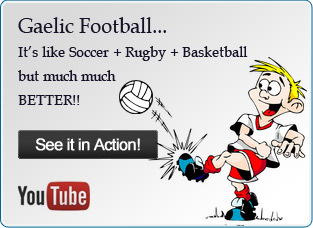 Those interested may contact me directly at gda.northeast.usa@gaa.ie or (617) 571 - 1708 to sign-up. IF YOU ARE NEW TO THE IRISH SPORTS YOUTH LEAGUE, YOU WILL BE REQUIRED TO SUBMIT A COPY OF YOUR CHILD'S BIRTH CERTIFICATE AND YOUR CHILD'S PHOTO WILL BE TAKEN AT A LATER DATE FOR ID CARD PURPOSES. IF YOU NEED MORE INFORMATION ON HOW TO REGISTER, PLEASE CLICK ON THE OVERVIEW AT THE TOP OF THE PAGE. Seasonal Full Time & Part Time Positions Available! Would you, a friend, or family member be interested in applying for the coolest outdoor job there is? Here's an incredible chance to join a growing company with fun people and lots of flexibility! We've got options for everyone! Full-time seasonal (April to November) – Pursue your passion for the outdoors! Summer full-time seasonal – The best summer job in Boston! Mid-week part-time – Be home in time for the kids! Weekends part-time – Supplement your income! Did you have an amazing family adventure or birthday party with us in a previous season? Hulafrog's Most Loved Awards™ recognize the best local resources for kids and families in hundreds of communities across the country. Vote for us as a hulafrog Most Loved Place to Go in the Boston Area! 2019 CYC Dates and Location - mark your calendars!! The 2019 Continental Youth Championships will take place in Philadelphia. The competition will take place on Thursday, July 25 to Sunday, July 28. We hope many of you will be able to attend and represent the ISYL. Sean Farrell Family Day - Sunday, April 14: Opening Day! !